Updated So, CES packs up for another year and everyone takes a break from the full-on, week-long frenzy. However, another big event is about to steal the spotlight as Apple is expected to announce an ultra-slim laptop at its annual show on Tuesday. The annual Macworld conference in San Francisco is the venue of choice for Apple CEO Steve Jobs to roll out new products and chart the company's course for the year. His Barnum-like behaviour has set the agenda for key announcements within the computer and electronics industries, and in recent years Macworld has served as a spoiler to CES, as the two events frequently overlap - as will be the case again next year: Macworld 2009 - Tuesday 6 to Friday 9, CES 2009 - Thursday 8 to Sunday 11 January. Apple's new wares are expected to be more of an enhancement to its current offerings rather than anything that packs the awe of last year's star attraction, the iPhone. Apple never gives any hint of what will be announced, so guessing what Jobs has up the sleeve of his black polo-neck is a favourite pastime of fans, analysts and industry folk. Speculation about the sub-notebook itself isn't new, we reported on rumours regarding this back in July and again when hip hop star Just Blaze allegedly spilled the beans after he was promised one for performing at a recent Apple Christmas party. Analysts are predicting a computer half as thick as the current MacBook lineup, but incorporating Flash memory rather than a hard drive. Many also believe Jobs will announce that customers will be able to rent downloaded movies from Fox, Warner Brothers and other big studios through its iTunes online store. Register Hardware will bring you all the very latest news from Macworld as it unfolds. Update: teaser banners have sprung up all around the Moscone Center site in San Francisco, the site of tomorrow's highly-anticipated Macworld Expo. 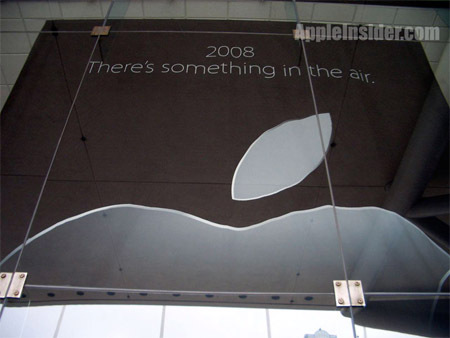 According to AppleInsider, the sprawling matte black banners hang above the entrance to the south hall and simply read: "2008. There's something in the air." What does this all mean..? Well, it's still tricky to tell. Some believe the new subcompact will be called the MacBook Air, and speculation on 9to5Mac suggests it will have the tagline "cables not included". Others postulate that it has something to do with the movie downloads. Exactly what cables won't be included is totally up in the air (maybe that's it), with talk of built-in WiMAX, Wireless USB or even induction charging being bounded about. Perhaps "air" simply refers to the the lightweight design of the new machine. 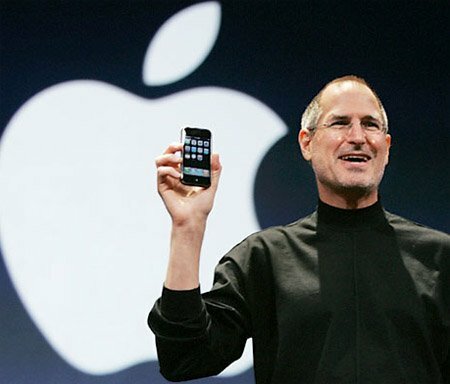 Register Hardware will be providing full, live coverage of Steve Jobs' keynote on Tuesday 15th January. The show kicks off at 5:00pm GMT/London time.